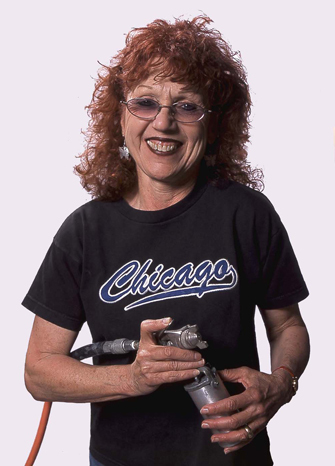 Judy Chicago is an artist, author, feminist, educator, and intellectual whose career now spans four decades. Her influence both within and beyond the art community is attested to by her inclusion in hundreds of publications throughout the world. Her art has been frequently exhibited in the United States and internationally, and her ten published books have brought her art and philosophy to readers around the world. The opening in March 2007 of the Elizabeth A. Sackler Center for Feminist Art at the Brooklyn Museum marks a key chapter in the history of this important artist, as it includes space specifically designed for the permanent installation of Chicago’s foundational work, The Dinner Party (1974–79). Not only a landmark in the artist’s long and productive career, the opening of the Elizabeth A. Sackler Center represents the first major step in the institutionalization of Feminist Art—and its rich, complex history—within the larger context of 20th-century art and culture. Chicago pioneered Feminist Art and art education in the early 1970s, through unique programs for women at California State University-Fresno and later (with Miriam Schapiro) at the California Institute of the Arts. Demonstrating an openly female point of view through collaborative art, Chicago helped to initiate a worldwide Feminist Art movement. She created The Dinner Party, described in the recent 7th edition of Janson and Janson’s Basic History of Western Art as “a powerful icon for women’s liberation and independence,” in the mid to late 1970s with assistance from hundreds of volunteers, including both men and women. In all her major collaborative projects, beginning with The Dinner Party and continuing through Birth Project (1980–85), Powerplay (1982–87), Holocaust Project: From Darkness into Light (1985–93), and Resolutions: A Stitch in Time (1994–2000), Chicago has chosen diverse and unusual media to fit not only her aesthetic, but also the personal, social, and political intentions of her imagery. Because of her gender politics and attention to social commentary, as well as her use of diverse styles and media, Janson and Janson’s history credits her not only for her role as a leader in the Feminist Art movement but also as a forerunner of the late-20th-century movement known as Postmodernism. A lesser known but important period in Chicago’s career is the Minimalist work she created between 1965 and 1973. Some of the optical patterns explored in these works, such as circles and octagons with central cores that appear to be expanding and contracting, prefigure her feminist iconography. In addition, recent exhibitions—at LAMOCA in Los Angeles, the Guggenheim New York, and the Centre Pompidou in Paris—have recognized Chicago’s output during that period as significant contributions to the direction and focus of Minimalism and, in particular, the sub-genre known as the Finish Fetish movement. Chicago is the recipient of numerous grants, awards and honorary degrees from prestigious colleges and universities; and her work is in the collections of numerous museums, including: The British Museum, Brooklyn Museum, Getty Trust, Los Angeles County Museum of Art, Museum of Fine Arts, Santa Fe, National Gallery, National Museum of Women in the Arts, Pennsylvania Academy of the Fine Arts, and San Francisco Museum of Modern Art.